For the people you love, order this mesmerizing gift of Exciting American Diamond Rakhi with Kids Special Best Brother Chocolate for Celebration on the occasion of Raksha bandhan to deliver your affectionate wishes and prayers. This Gift is consist of 1 American Diamond Rakhi with Best Brother Chocolate. Deliver this smart and stylish 2 American Diamond Rakhi to your Brother with Best Brother Chocolate. 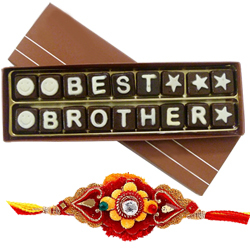 Deliver this smart and stylish 4 American Diamond Rakhi to your Brother with Best Brother Chocolate.